I decided this weekend to take my armoire decoration up a level. I was starting to no longer be a fan of the taped up wrapping paper that looked nice from the outside, but tacky on the inside. 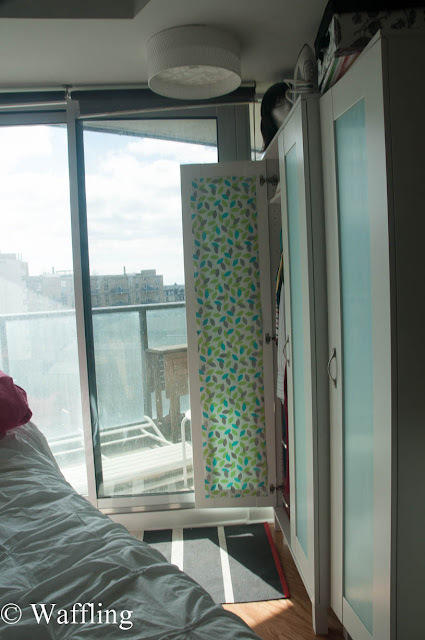 I'm going to be 27 soon- my armoire needed to grow up. 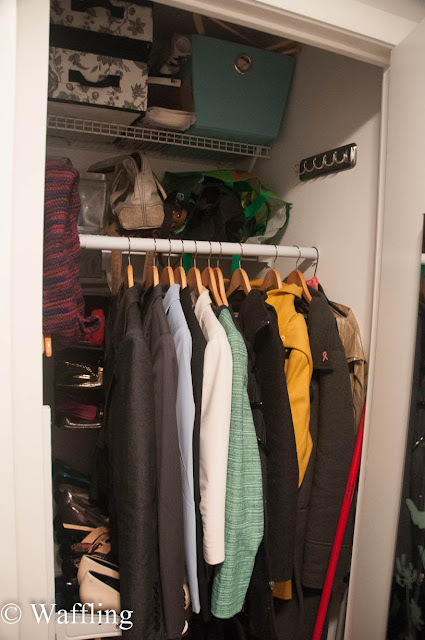 For the record, my entire closet system is from the Aneboda line from Ikea. Except they don't seem to sell the skinny tall version, or the short little dresser anymore. Such a shame because they are very practical pieces for very reasonable prices! I originally tried to paint the plastic part, but it looked HORRIBLE and messy and basically a disaster so I wiped it off. After deliberating some options, I decided to use wrapping paper again, but fit it exactly into the see-through space and change up the look. First, I carefully marked off a pencil line along my new paper, checked every so often to make sure it was still exactly 8" wide. 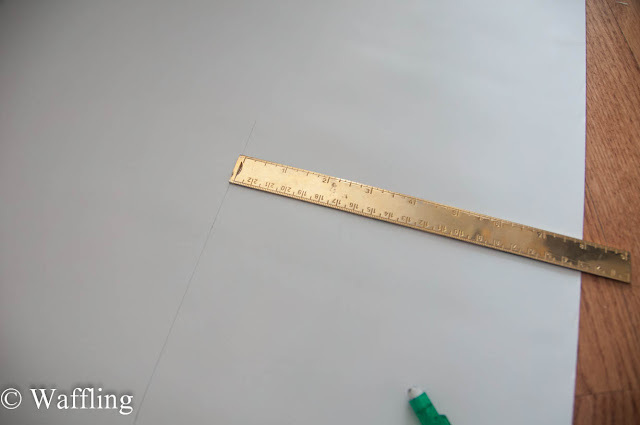 Once it was all marked out, I carefully cut it out with scissors and attached to the door with double sided tape. Bam-sha-bam it was a perfect fit! Go me! I then repeated on all three doors and the front of the small dresser beside them. 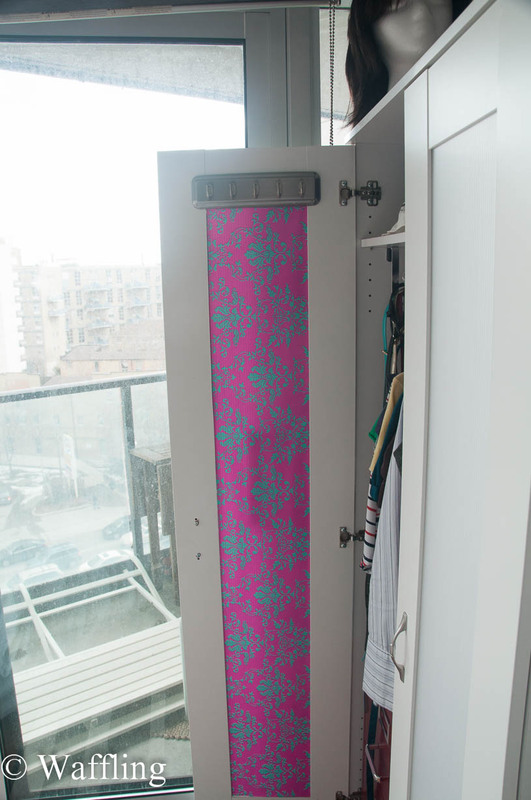 It ended up being a perfect fit across my paper- I only needed to use under 60" of the wrapping paper, so I have plenty left for wrapping gifts :) I looove this hot pink and turquoise pattern. I then decided that I needed to update the functionality of the doors, now that they were so much prettier. Remember the hooks from my front hall closet that used to hold scarves? Well they found a new home! 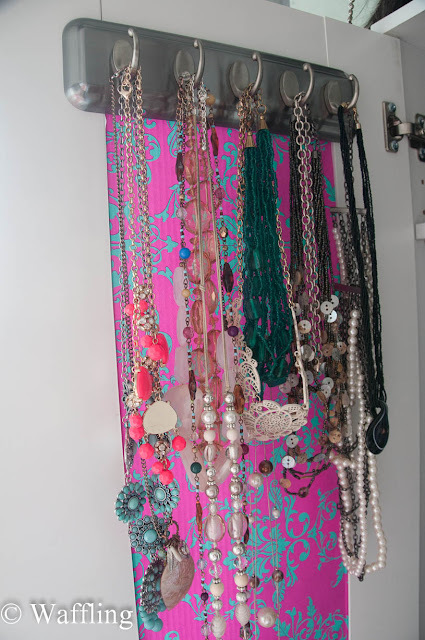 I decided to move my favourite statement necklaces from the bathroom to the "dressing room" in an effort to make my bathroom more clean, so they came out here! Now I can put them on when I put on my outfits in the morning. 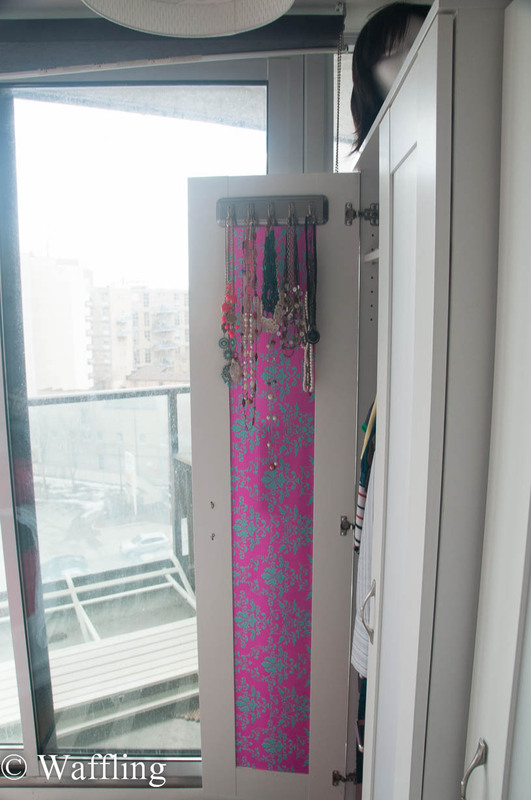 I also want to install a mirror back here so I can do all my jewelry in the "dressing room". I think I will also eventually want to add more necklace hooks on this door because it is a little crowded right now. 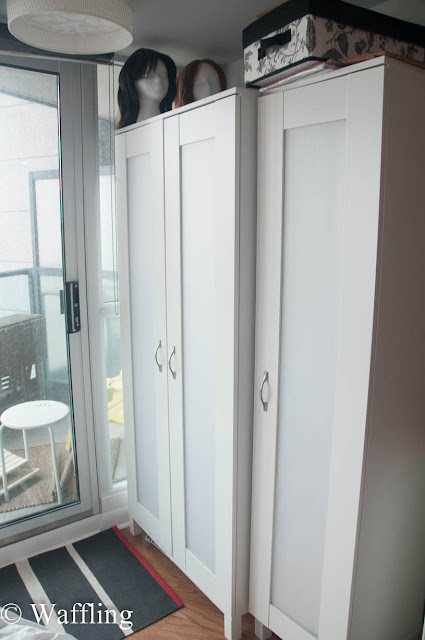 I am loving my armoires now! I just have to get used to the white outsides vs the turquoise. I thought about backing the new pink paper with the old turquoise, but ultimately decided I preferred the all-white look. I love the new and improved grown-up look! Very nice indeed. And wow you have a lot of necklaces, I think I own 4.